Alright team. Strap in. This one’s a biggy. We’ve got release dates, albums, new merchandise, new team member. Everything’s in here because we’re so busy we have to bundle all our news at once! Let’s get down to it! We’re leading with a big one: Our dates are locked in. Hollow Knight’s fourth Free Content Pack, Gods & Glory will be arriving for all players on August 23rd! We said this’d be the largest pack yet and we weren’t lying! A whole bunch of new bosses. A slew of new music. New NPCs. New Quests. The final chapter for the knight is turning into the celebration we hoped it would be! We’re so eager to get this one out to you all, and we’re so close. Get your PC or Nintendo Switch ready for the end of August. We’re gonna put your Hollow Knight skills to the test! This one’s been hinted at for a while and today it’s being officially unveiled. The second Hollow Knight album by Christopher Larkin: Gods & Nightmares. hrough Hollow Knight’s Content Packs, Chris has been expanding Hollow Knight with a full suite of incredible new tracks. Gods & Nightmares packages them all together in one epic album (along with an all new, live recorded arrangement, Pale Court). It’s not been said before, but Chris created all of the extra Hollow Knight music for free! If you love the music (and sound) of Hollow Knight, buy the album and support this incredibly talented composer! Hollow Knight Gods & Nightmares is releasing on Steam ($4.99USD) and all major digital platforms (Bandcamp, iTunes, Spotify) on August 9th. But wait! The Gods & Nightmares saga doesn’t end there. Our friends over at Ghost Ramp have been working around the clock to produce this stunning, limited Vinyl, collating all 15 of the new tracks onto one very large, very cool disc. Just check out this crazy package! The original Hollow Knight LP is one of our favourite things ever, and we’re so darn excited for this new limited album, all done-up in spooky Grimm-style. If you’re keen on getting into Gods & Nightmares in the most retro/classy way possible, or just want to support great music, then hurry over to Ghost Ramp and pre-order the darn thing right now!! The final note on Hollow Knight music: the Pale Court live recording session also covered several other classic Hollow Knight tracks. Chris will be releasing those additional recordings for free through his Bandcamp in the coming months. Keep your eyes on https://twitter.com/composerlarkin or https://christopherlarkin.bandcamp.com/ for all the details. HK had its surprise Switch release during E3, but just as important our friends at Fangamer announced a selection of smashing new HK goods. 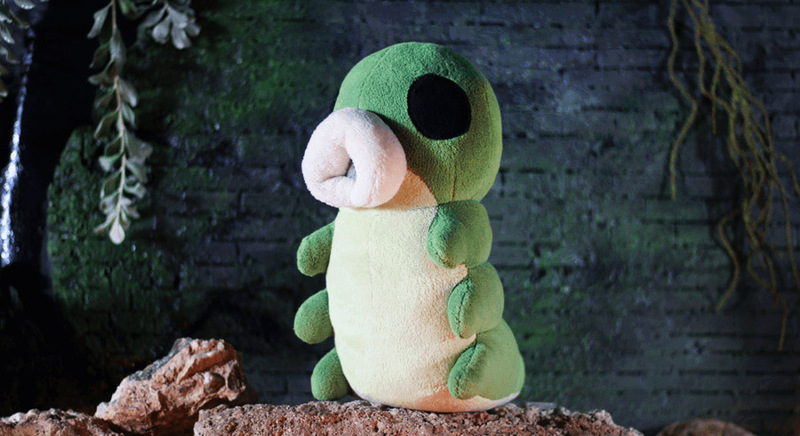 The feature item: This gigantic, talking plush Grub! Yep! This thing is legit. It’s huge. It’s huggable. It’s squishable. It murmurs lovingly at you when tightly squeezed. It’s basically going to be the loyal, adoring companion you’ve always dreamed a grub would be. You can pop over to Fangamer and pre-order your very own squishy-grub friend right now, and while you’re there, check out all the other cool HK merch that’s just dropped. New Tees. New print. Fangamer, you’re the best! This one’s just some quick housekeeping. If you’re a Hollow Knight player on Nintendo Switch, you may have noticed a small update go out last week. That’s our bug fix patch to address a few stability issues and some niggling bugs in the release version. With those fixes out of the way, our next update will be Gods & Glory, which will roll in a few more small fixes, including controller re-binding on Switch.